As an outsider it is always easier to pass judgment on others during difficult times. We can proclaim how we would never have done this, or would have never participated in that with an air of self-righteousness. Of course, it is a completely different beast when one must actually live within the horrors that other chastise. While we would like to believe that everyone has the freedom to choose their own path, there are times when the prevailing view of society, regardless of how wrong they are, can become too overwhelming. As a result, choices that are made in the name of patriotism can lead to truly horrific consequences. It is this conflict between personal conscience and the widespread immorality of society that beats at the heart of Stanley Kramer’s Judgment at Nuremberg. Set a few short years after the events of World War II, the film revolves around a military tribunal taking place in Nuremberg, Germany. Chief Trial Judge Dan Haywood (Spencer Tracy) and his panel must decide the fate of four men who stand accused of crimes against humanity during the Nazi regime. Haywood is perplexed that the defendants, by all accounts extremely educated men, could go along with the atrocities the Nazis committed. One of the defendants in particular, Dr. Ernst Janning (Burt Lancaster), is especially puzzling to Haywood. Janning, an internationally respected legal scholar, acted as a judge in several of the corrupt Nazi trials that sentenced many to death in the gas chambers. Though the prosecuting attorney, Colonel Tad Lawson (Richard Widmark), believes that a crime is a crime and should be punished accordingly, the fact that the actions of the men were part of a greater systemic problem complicates things. 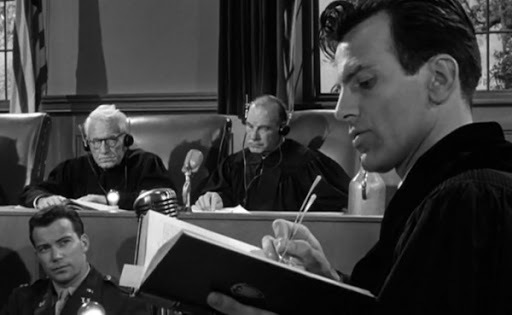 The defense attorney, Hans Rolfe (Maximilian Schell), tries to prove that the four judges were merely complying with the government’s wishes. He argues that in order to condemn Janning and the other men on trial, all off Germany must be put on trial as well. In an attempt to try and understand how so many people could ignore the Holocaust that was happening under their noses, Haywood tours Nuremberg to get a feel for the people. He eventually meets and befriends Mrs. Bertholt (Marlene Dietrich), the widow of a German general who opens his eyes to just how complex the situation was for many Germans during Hitler’s rule. 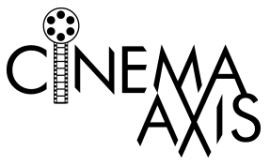 Instead of merely focusing on the horrors that were committed during the Holocaust, Kramer’s film aims to generate thoughtful discourse on the strengths and weakness of the human conscience. Kramer does not condone the role that certain German’s played during World War II, but he strives to give us a better understanding of the mindset of the people during that time. Though there has been numerous films that have tackled various aspects of the Holocaust, only a handful have offered a compelling view from the German perspective. 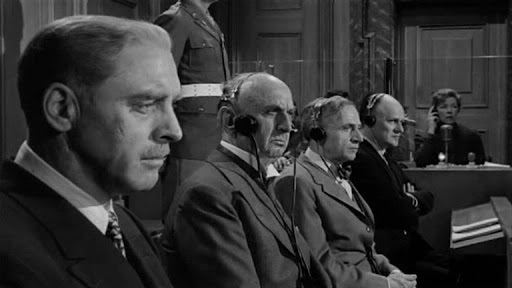 Judgment at Nuremberg ensures that it balances the facts associated with the Holocaust with the philosophical questions regarding basic human morals. Considering that the bulk of this discussion takes place within the confines of a courtroom, it is a testament to Kramer’s direction that the film does not feel like a standard legal procedural. Kramer uses several smart camera techniques, including subtle pans to reveal other key characters in the frame, to keep the drama engaging. The film also finds an inventive way of overcoming the language barriers within the court. Although, from an audience perspective, all the actors speak English, Kramer uses a few early well shot scenes to highlight the use of a group of translators in the proceedings. It is especially effective when both counsels get into extremely heated debates and must grab their headsets to hear what the other is saying. The performances by Widmark and Schell really help to provide additional heat to the philosophical divide of both lawyers. Schell, in particular, is very good as a man who believes he is not just representing Janning and crew, but Germany as well. While the supporting cast, which also features William Shatner and Judy Garland, is solid all around, it is Lancaster who steals the show. He perfectly encapsulates both the arrogant pride and reserved conflict of conscious that resides in Janning. Judgment of Nuremberg is a film that effectively gets the audience to look at the Holocaust from two distinct sides. It does not justify the actions of the Nazi supporters, but highlights how certain aspects of the Holocaust were not as black and white as they appeared. Kramer’s skilled direction, not to mention the fine performances, helps to craft a film that is both respectful of the victims while simultaneously questioning how others let such evil happen. Really great review. This part of history has always fascinated me, and I've heard of this movie, but I didn't know the details. I had no idea all these great actors were in it too! Going to have to check it out. Wait – you're working ahead? Who said you could work ahead?? This is a film I've been wanting to see for some time. Now I'm even more interested in it. Montgomery Clift was exceptionally good in that one scene. His more effective in his brief time on screen than Judi Dench was in Shakespeare in Love. If this part of history interest you than you should definitely make a point to see this film. If nothing else, it should evoke some good discussions. Technically I am catching up. I missed my April Blind Spot piece as I getting ready to cover Hot Docs. Considering how well versed you are in the classics, I am actually surprised you have not seen this film. I would be interested to read your thoughts on the film when you finally get around to seeing it.